Gor Mahia, still flying high after their surprise 4-2 win over Zamalek will take on Vihiga United at Bukhungu on Wednesday. Coach Oktay will need to get the players to forget about the Zamalek match and focus on the local scene again. If players get carried away, they might lose focus. However coach Oktay believes the result against Zamalek will only bolster the team. “Last week we were under a lot of pressure but the victory has helped us to calm down. The boys are now more confident and I don’t expect any more poor results. The only problem is that we have a tough schedule but we shall cope.” he told the Nation. Vihiga for their part are aiming for improvement. They are only two points above the relagation zone and have scored the second fewest number of goals. “That is a respected opponent for sure, but we want to give our best. We are aiming at three points. We have a problem in front of the goal but we are working to rectify that”. said assistant coach Francis Xavier to the Nation. Vihiga United are experts at forcing draws. They have drawn 7 matches out of the 11 that they have played. They will likely deploy an ultra defensive line-up against Gor Mahia even though coach Mururi claims they are going for three points. Indeed last season Gor Mahia did not fair well against Vihiga United. After struggling to win the first leg 1-0, they lost to Vihiga 2-0 in the second leg. 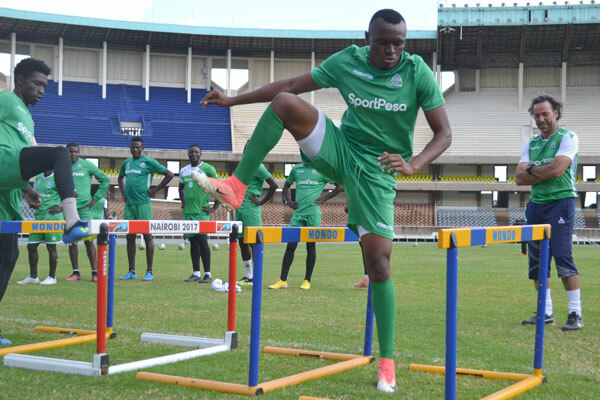 Gor Mahia were made to work hard for three points at Kisumu on Saturday. But they were finally ever to overcome resistance from Vihiga. The all important goal came from Jacque Tuyisenge. Gor Mahia’s perfect run in the Kenyan Premier League continued after registering their seventh win in eight matches. The sixteen times champions came into the match as favourites, owing to Vihiga United’s poor run that had seen the team draw four and lose three of their last seven matches. Vihiga was keen on defending, as seen in the first few minutes, trying to play long balls and relying on counter attacks. But their resolve was broken in the fourteenth minute when Francis Kahata did well to pick Jacques Tuyisenge, and the latter did well to put the ball past Barnabas Tiema. Former AFC Leopards man Charles Okwemba could have leveled matters in the 19th minute after a good pass by Christopher Masinza, but he failed to hit the target. The visitors had Tiema to thank for keeping the score line 1-0, after he made a number of stunning saves that denied Meddie Kagere. Tuyisenge, George Odhiambo and Kahata were all guilty of missing great chances as K’Ogalo moved top of the group on 19 points. The champions, who are preparing for Caf Confederation Cup first leg match against SuperSport United, have won seven matches and drawn one, scoring fourteen goals in the process. Gor Mahia XI: Bonface Oluoch, Philemon Otieno, Haron Shakava, Joash Onyango, Wesley Onguso, Samuel Onyango, Francis Kahata, Humphrey Mieno, Meddie Kagere, George Odhiambo and Jacques Tuyisenge. Reserves: Fredrick Odhiambo, Charles Monyanyi, Innocent Wafula, Bonface Omondi, Bernard Ondieki, Kevin Omondi and Ephraim Guikan.